Last fall I undertook a large lawn renovation using organic products to get a darker, greener lawn that wouldn't require as much effort. I documented the steps I took and products I used through different posts. Now let's look at the results and my final opinions and thoughts. But before we do... a little recap. I started out by neglecting my lawn from around the summer on. It got baked, weedy and diseased as it normally would unless I maintain it. In the fall I killed the lawn and weeds so I can test 2 different organic herbicides. I didn't plan to wait this long to share my results, especially after putting so much effort into the renovation and posts. Unfortunately last year in the middle of this series I was affected by some changes Google made and lost a significant amount of visitors to this site as a result. I think that's all taken care of now. Around the same time Hurricane Sandy hit which left me with some issues to deal with. Some of which affected this project. It's been a rough year and the Google thing not only took my normal writing time away but also made me lose my motivation. I'm not trying to excuse what happened, just trying to explain it. A few of you have emailed me and I did my best to answer your questions and email some photos to help you make your decisions but I'm still very sorry that it took so long to get this post up. Let's get to the good stuff. 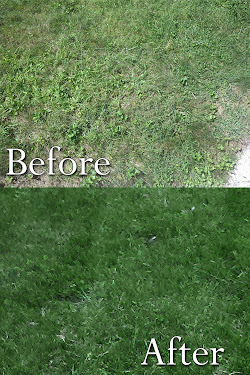 The before and after photos of the lawn. There are some issues that came up and some things I would do differently that I'll discuss below. Section I gets full sun and not a lot of traffic. It was a mix of different grasses. Everything from tall fescue, fine fescue and kentucky bluegrass. It was prone to disease and looked unsightly. 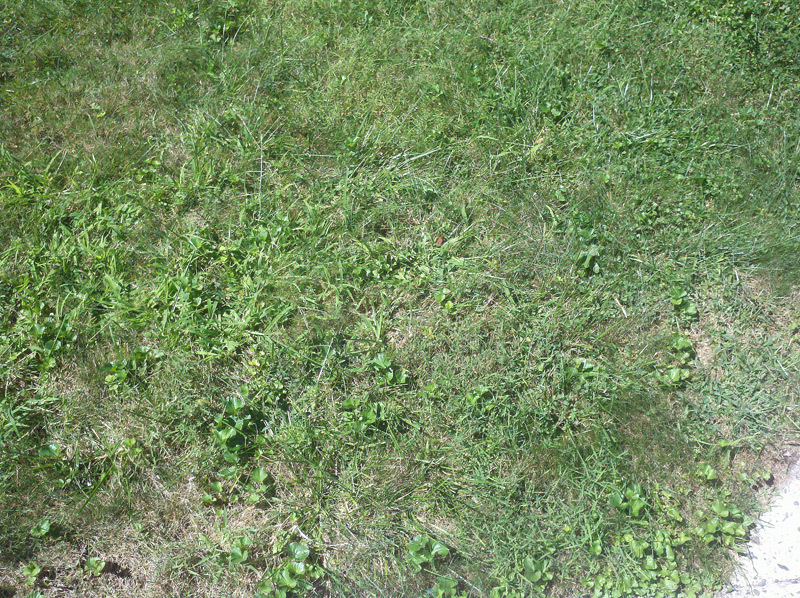 Some fast growing, unimproved tall fescue along with either wild onion or wild garlic weeds made it look uneven only a day or two after mowing. 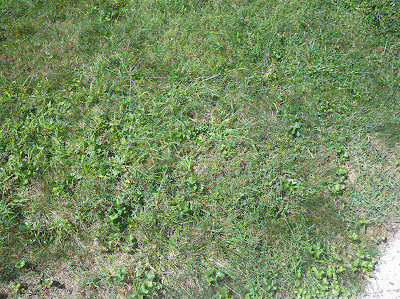 There were a few other weeds mixed in as well as a result of neglecting it leading up to the renovation. Sections 2 and 3 weren't to bad. They were in shade with section 3 being in very heavy shade. After the hurricane however they wound up getting more sun. Unfortunately both sections wound up being covered in debris for a long period of time and had divots and compaction issues due to the debris and workers. A little over seeding in the spring helped fix that but did lead to another issue with disease that I'll discuss in detail further down. Section 2 was mainly kentucky bluegrass while section 3 was a dense shade mix consisting of mostly fine fescues. 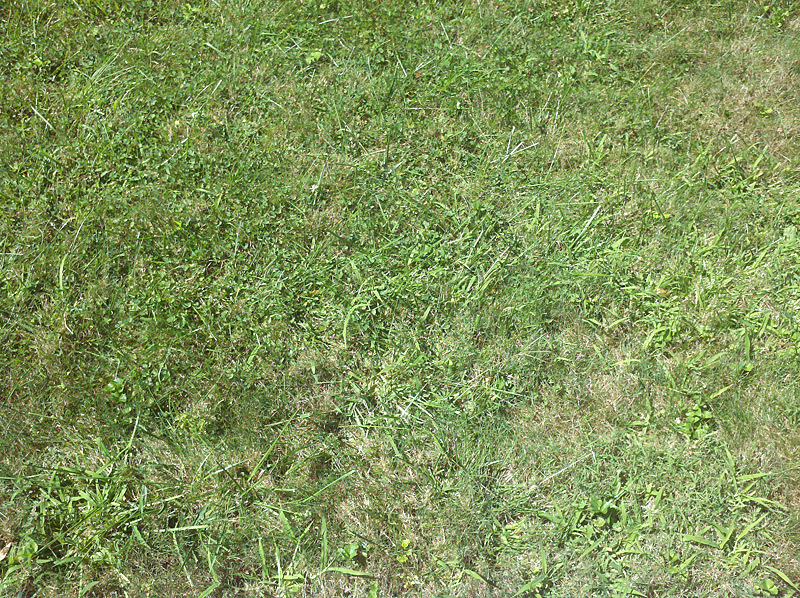 You can see a little bit of the neighbor's lighter fine fescue lawn in the back for comparison of the color. It's possible to do a lawn renovation using completely organic products without having to resort to the use of RoundUp or other glyphosate herbicides. BurnOut II and Nature's Avenger both performed better than I expected at killing the existing lawn and weeds . I couldn't really tell a difference between the two. The only recommendation I would make is to get the concentrated versions of either and use a good pump sprayer. I'm happy with the grass. The tall fescue isn't as wide as I feared and it passed the all important barefoot test. 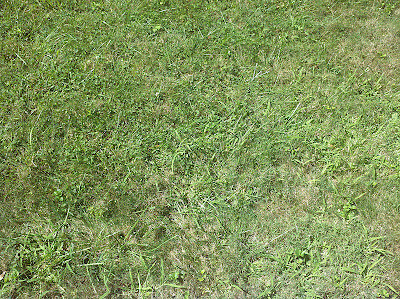 It has a nice color and it's great having a consistent looking lawn that grows at the same rate. There were however some issues and some things I would do differently. 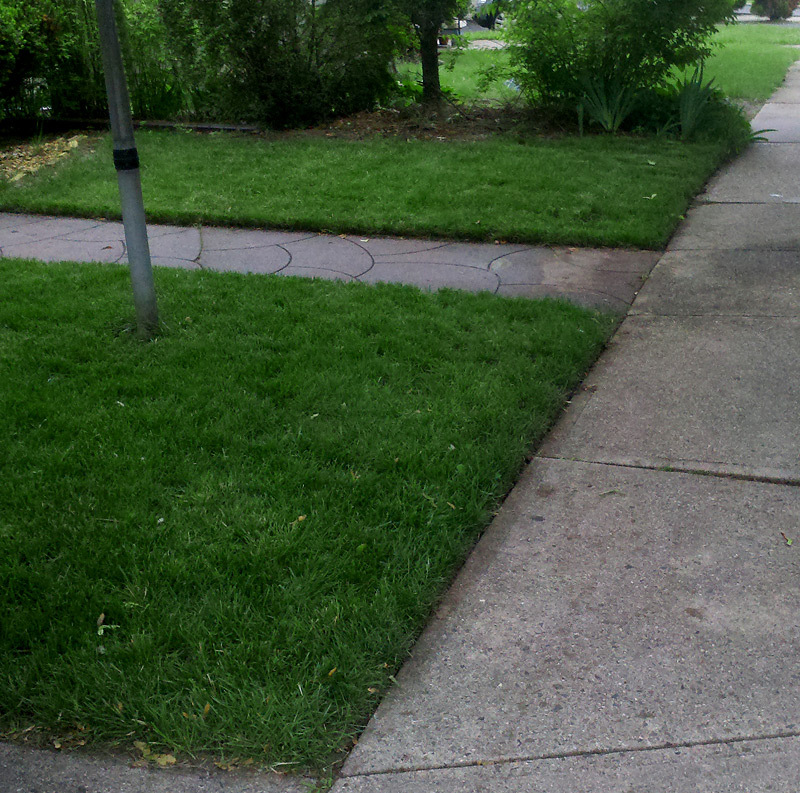 As I mentioned, the organic herbicides I used did a good job killing the existing lawn and weeds. After I spread the tall fescue seed and began watering I noticed that in some areas where I had to work the soil more to fix the grade there were a lot of weed seeds germinating. I believe they were leafy spurge. The were competing against the tall fescue which grew thin in those areas as a result. The weeds were much lighter in color than the Black Beauty grass. I did my best to hand pick as many as I could but as you can see, there were a lot of them. Thankfully they were mostly contained to Section 2 where I had to work the soil more than the other areas to fix the grade. In the spring I spot treated the areas and then reseeded. What I should have done is what most people would do when renovating a lawn with RoundUp. Spray the area and let everything die. Resurface and amend the soil, which will bring up weed seeds, and then water for a week or two to allow the weed seeds to germinate. Then spray them again. Alternately I would start to solarize the lawn in the summer. 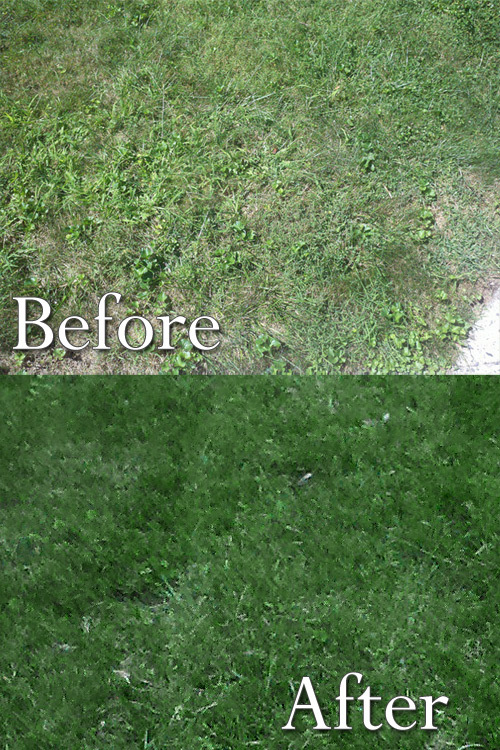 Solarization not only kills the existing grass and weeds but also kills weed seeds in the soil as well as soil born pathogens which can lead to lawn disease. I'm still getting some weeds in the lawn but a lot less than in the past. It's easy to keep them in check by hand pulling a few here an there. I used Jonathan Green Black Beauty grass seed which is claimed to have good disease resistance.The lawn didn't exhibit any signs of disease for most of the season which was nice considering one of the reasons for replacing the lawn was due to the frequently occurring disease in one section. This year we had more than double the amount of rain we usually get and there was a long hot spell around the same time and the lawn developed summer patch (fusarium) in some spots. It was interesting because it seemed to be in the spots that were either weedy or thin from the resulting damage from the hurricane. I couldn't make heads or tails of it. Why would the damaged or weedy areas be more susceptible to disease? 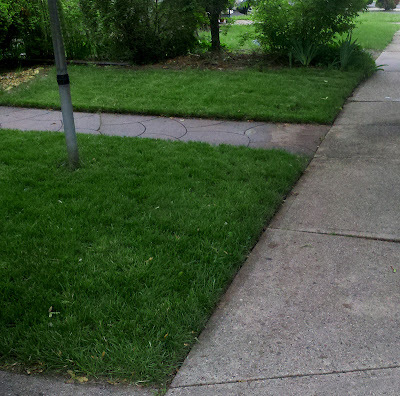 Could it be compaction, or maybe because the lawn was covered for such a long period of time? But that didn't explain the weedy areas. Then yesterday I ran across this paper from the USDA titled Fusarium Species Associated with Tall Fescue Seed Production in Oregon. 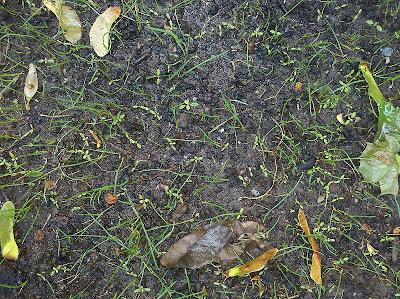 A lot of tall fescue seeds from Oregon, where a lot of grass seed is grown, was infested with fusarium which caused poor germination rates and disease to form in the grass. The paper was from 2004 so I'm not sure if it's a current problem but it did provide some useful information. Fusarium affects tall fescue when it's young and especially if it's seeded in the spring. I overseeded the thin areas in the spring which explained why the patches were where they were. The paper suggests that soaking the seeds in a 3% solution of Hydrogen Peroxide for 60 minutes, then rinsing with sterile, distilled water greatly reduced the incidence of the disease in the seedlings and increased the germination rate. I used corn meal in those areas which seemed to be effective. There were one or two spots I think I got to late and I had to seed them again this fall. As the tall fescue plants age the paper indicates they become less susceptible. Hopefully next year won't be as bad and I'll know I still need to apply corn meal to help with disease. In the past I also Organica Plant Growth Activator Plus which contains trichoderma and bacillus subtilis which helps with disease but when Espoma bought Organica they dropped the product. I did find another product called RootShield which contains trichoderma which I may try if I have more issues next year. I'm exploring other options as well. Compared to the grass that was previously growing in these areas, Black Beauty is performing much better given the amount of disease pressure. 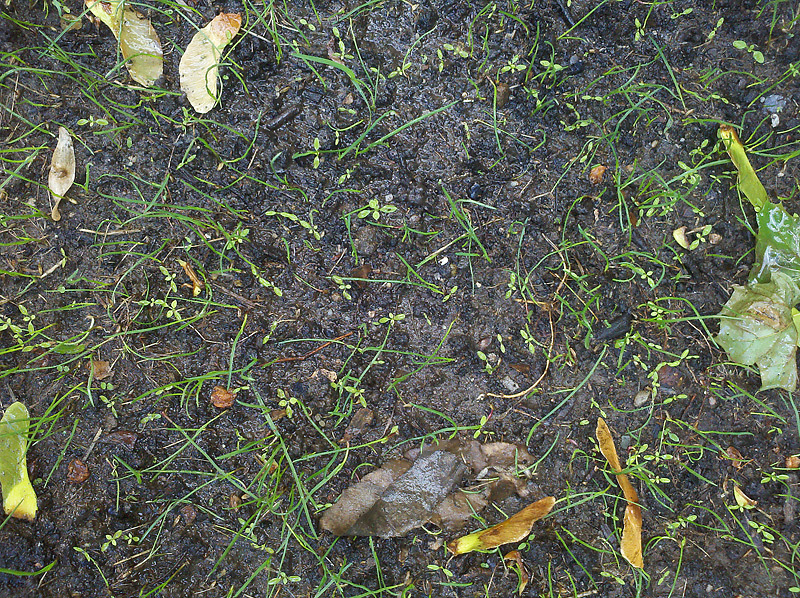 There are a few isolated spots that had issues with disease due to the spring overseeding. After reseeding this fall and properly managing for disease next year I feel confident that I can keep it in check next year. It was a lot of work but the work was enjoyable. There were some issues that will hopefully go away but overall I'm happy with how things turned out. 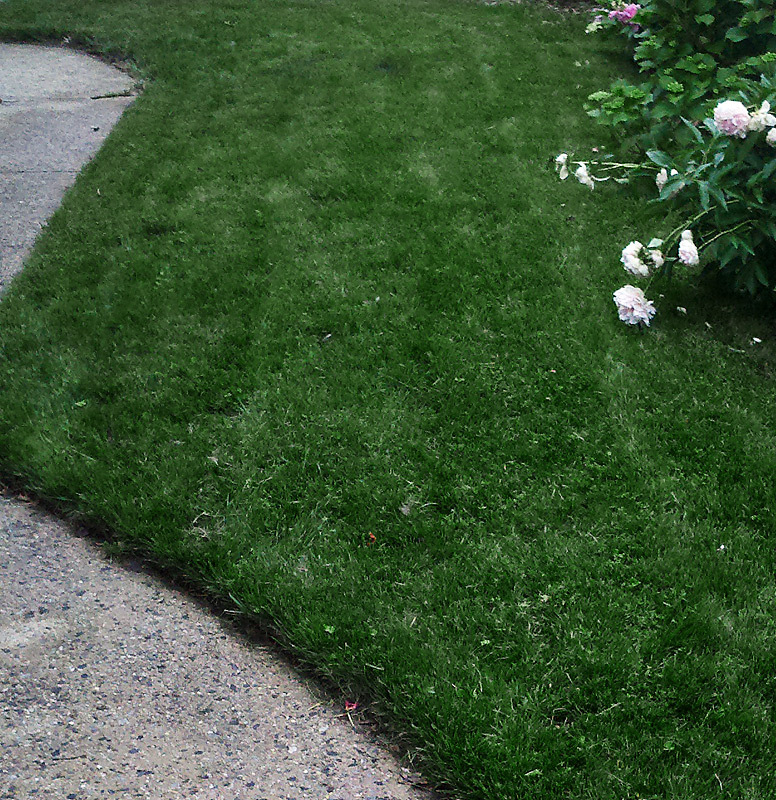 The lawn looks much better than it did before even without much maintenance or watering. It looked great before summer patch set in and still looks very good now. Thanks for the article. Did you plant all 3 sections with Black Beauty? How are the shady areas doing now? Your front walk looks interesting. Is it textured concrete or large pavers?